Consumers most likely to report being “very concerned” about environmental problems and related health impacts hail from the BRIC countries of Brazil, India and China, Latin American nations of Mexico and Argentina, and South Korea. While China and the U.S. are the world’s largest emitters of climate-altering greenhouse gases, consumers in each country take rather different stances on environmental problems and sustainability. These are a few of the findings of the fourth annual Greendex survey of environmentally sustainable consumption, a consumer research project of the National Geographic Society (NGS) and market research firm GlobeScan. The latest Greendex report surveyed approximately 1,000 consumers in each of 17 developed and developing countries around the world. The market research study analyzes attitudes, consumer behavior and lifestyles with the goal of “inspiring action” to protect the Earth’s natural environment through more sustainable consumption. Ecosystem services refer to the essential role the Earth’s natural resources play in supporting everyday life and business activity. For example, natural capital like forests, oceans, watersheds and the Earth’s diverse array of living species (biodiversity) are responsible for regulating climate, replenishing soil and supplying the basic raw materials for commerce and economic development. Excessive consumption depletes the Earth’s limited supply of natural resources and capacity to provide ecosystem services. The negative consequences range from endangering the livelihoods’ of smallholder farmers to submerging whole island nations. Consumers in the Latin American countries of Mexico and Argentina and BRIC countries of Brazil, India and China take top honors for their high level of concern about environmental problems. On a scale of one to five from “strongly agree” to “strongly disagree,” 68 to 72 percent of consumers in Brazil, Mexico and Argentina agreed with the statement “I am very concerned about environmental problems,” by rating their level of concern at 4 or 5 on the five-point scale. In each case, 45 to 46 percent of respondents strongly agreed with the statement, while only 6 to 9 percent disagreed. In China and India, 72 and 65 percent of consumers, respectively, agreed with being very concerned about environmental problems, while 38 percent of respondents in both countries strongly agreed. At the other end of the chart, respondents in the developed countries of Sweden, Australia, Britain, Germany and America expressed the least concern over environmental problems. A low of 14 percent of Swedes to a high of 20 percent of Americans indicated strong agreement, while a range of 19 to 26 percent of respondents from the five countries disagreed. Consumers in certain European countries like Sweden and Germany may be less concerned about environmental problems because those countries do a better job of protecting their environments and have fewer environmental problems. On the other hand, their responses could also reflect a lack of appreciation for the global nature of environmental issues like climate change and the potential for environmental problems in even distant countries like China to have spillover effects around the globe. Consumers in the BRIC countries of China, Russia, India and Brazil were most likely to recognize the immediate relevance of environmental problems to their own personal health. The share of consumers who agreed with the statement, “Environmental problems are having a negative impact on my health today,” ranged from 57 percent of Brazilians to 69 percent of Chinese. In China, India and Brazil, 33 to 38 percent of consumers strongly agreed with the statement. Consumers in Mexico showed the greatest concern for the environmental issues of climate change and global warming. A majority of 59 percent of Mexican respondents were very concerned about the environmental degradation of the Earth’s atmosphere, while 83 percent were concerned. Only 6 percent of survey takers in Mexico felt little or no concern. In the BRIC countries, 70 to 79 percent of consumers in China, India and Brazil were concerned about climate change and global warming, while 36 (China) to 53 (Brazil) percent were very concerned. Russians are less bothered by climate change and global warming than their BRIC country counterparts. A relatively low 23 percent of Russians reported being “very concerned,” while 25 percent of Russians were unconcerned. South Korea followed closely on Mexico’s heels with 82 percent of respondents concerned about climate change and global warming and 43 percent very concerned. Only 3 percent of survey takers in South Korean were unconcerned. Consumers in the U.K., U.S., and Australia indicated the lowest levels of concern about climate change and global warming. A range of 16 percent of British to 21 percent of American and Australian respondents was very concerned about changes to the Earth’s atmosphere, while a quarter of survey takers in each country indicated little or no concern. Air and water pollution are top environmental issues for developing countries in the survey. Most all of China’s major cities, including Beijing, Shanghai and Guangzhou, have air pollution levels three to six times higher than those recommended by the World Health Organization (WHO). In China, Mexico and Brazil, 83 to 86 percent of consumers were concerned about air pollution, while 55 to 57 percent were very concerned. India, Russia and Argentina were not far behind with 75 to 78 percent of survey takers concerned and 47 to 51 (India) percent very concerned. In China and Brazil, 89 and 85 percent of respondents, respectively, were concerned about water pollution, while 59 and 62 percent were very concerned. Elsewhere in Latin America, 88 and 82 percent of survey takers in Mexico and Argentina, respectively, were concerned about water pollution, while 65 and 58 percent were very concerned. The close links between air and water pollution and personal health help explain the overlap with countries’ whose respondents strongly agreed that environmental problems are negatively impacting their health. Scientists have predicted that more than two-thirds of the world’s population could face water shortages by 2025. The Greendex findings suggest consumers in developing countries are well aware of this looming threat. In Brazil and Mexico, 80 to 84 percent of respondents were concerned about inadequate water supplies, while 59 to 60 percent very concerned. In India and Argentina, the share of concerned survey takers ranged from 74 to 77 percent, with 49 to 53 percent very concerned. In China, 72 percent were concerned and 40 percent very concerned. The Latin American countries of Mexico, Brazil and Argentina are most bothered by the loss of biodiversity that is critical for ecosystem services. In Brazil and Mexico, 72 and 74 percent of respondents, respectively, were concerned about the loss of species and habitat, while 47 percent of survey takers in both countries were very concerned. Argentina follows closely behind with 70 percent concerned and 43 percent very concerned. Ironically, while developed countries have long emitted far higher levels of greenhouse gases per capita, consumers in developing countries expressed considerably more guilt over the environmental implications of their behavior. In five countries – India, Mexico, China, Brazil and Argentina – 35 to 45 percent of consumers agreed with the statement, “I feel guilty about the impact I have on the environment.” By comparison, only 19 to 24 percent of consumers agreed with this statement in the developed countries of Australia, Canada, France, Sweden, the U.K. and the U.S.
Oddly enough, while consumers in developing countries felt the most guilt over their own environmental impact, they also tended to feel the least empowered to do something about it. In Brazil and India, 38 and 42 percent of consumers, respectively, agreed with the statement, “The impact that our society has on the environment is so severe that there is very little individuals can do about it.” In China, the corresponding share of consumers rose to 53 percent, with 27 percent strongly agreeing. Perhaps reflecting a trend in the lingering effects of centralized control, a staggering 66 percent of Russian consumers expressed the futility of their personal role in influencing the state of their country’s environment. On the other hand, consumers in China, Mexico, Brazil and India were mostly likely to agree with the statement, “I am currently trying very hard to reduce my own negative impact on the environment.” In these countries, 55 to 65 percent of consumers agreed with the statement, while 24 (India) to 33 (Brazil) percent strongly agreed. The Greendex itself is an index of sustainable consumption that scores the environmental impact of each consumer’s behavior in four categories or sub-indexes: housing (30 percent weighting), transportation (30 percent), food consumption (20 percent) and goods (20 percent). The goods sub-index is further divided into everyday purchases and disposal and big-ticket items such as appliances. Each survey respondent receives an individual score, with points awarded and subtracted for behavior that is considered more or less sustainable. Individual scores are aggregated to arrive at overall results for each country in the survey. The housing sub-index consists of 24 variables that measure the environmental impact of consumer behavior involving housing choices and the use of utilities. Variables account for such factors as residence size relative to the number of inhabitants, home heating and cooling, energy consumption and water usage. Consumers in China are much more likely to use coal to heat their homes. Thirty-seven percent of Chinese survey takers identified coal as their primary energy source for home heating. India and Russia came in a distant second with only eight percent of consumers in each country relying on fossil fuel as their main energy source. Although, those reviewing the survey data may be left to wonder why the shares for each type of primary energy source sum to well over 100 percent for some countries. Questions could also be raised about the meaning of data on the share of households in each country that contain an energy-saving television or even energy-saving appliances. Without more information, the energy-saving feature could just be a function of TVs or appliances that are purchased for reasons that have nothing to do with the environment or sustainable consumption. Alternatively, consumers could be choosing energy-efficient products due to sales or other financial incentives rather than their environmental impact. The transportation sub-index consists of 17 variables selected to measure the environmental impact of consumers’ transportation choices. Consumers receive higher index scores for walking, biking and using public transportation. Those who drive lose points for owning more and bigger cars, traveling greater distances and driving alone. Consumers in India use motorcycles or motor scooters far more frequently than respondents in any other country, with 34 percent of Indians riding every day or most days. In spots two and four, only 8-9 percent of consumers in China and Brazil ride with the same frequency. 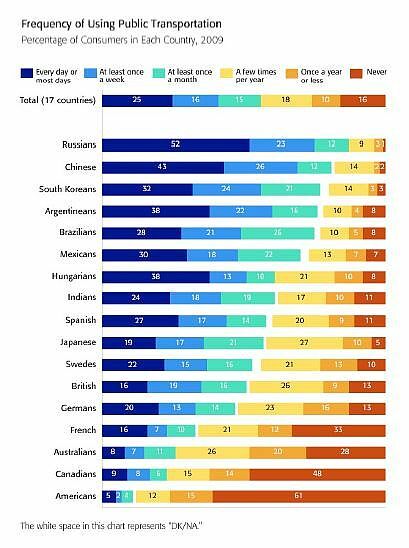 Consumers in developing countries generally make the most frequent use of local public transportation, with Russia, China, South Korea and Brazil taking the top four spots. Survey takers in China, Hungary, Germany and Brazil most frequently walk or ride a bike to their destination. Respondents in China, Germany, Japan, Sweden and Hungary make most frequent use of bicycles. The food sub-index rewards consumers who eat fruits and vegetables, locally produced foods and foods they have raised themselves. Points seem to be subtracted for consumption of beef, chicken, seafood and bottled water. While the report rightly recognizes livestock’s large environmental impact, this approach seems to obscure important differences in the environmental impacts of different species and the methods used to raise and harvest them. When it comes to fish consumption, low-level predators like sardines have a much smaller environmental footprint than high-level predators like salmon and tuna. The goods sub-index consists of 16 variables that measure the environmental impact of consumers’ buying behavior. Consumers earn points for factoring the environment into their purchase decisions, avoiding environmentally harmful products and excessive packaging, being willing to pay a premium for environmentally friendly products, preferring reusable to disposable products and recycling. Consumers lose points for owning more electronics, appliances, recreational vehicles and residences. The Greendex indices yield some interesting results. Consumers in Brazil were much more likely to report purchasing “green electricity” than respondents in other countries. Despite having some of the world’s most successful electronics companies like Samsung and LG, South Koreans report owning the fewest TVs. Those looking to start a thrift store would do well to avoid Japan. Japanese respondents stood out for their strong preference for buying new products over repairing or reusing ones they already own. The Greendex research provides ample data to suggest that consumers in developing countries are more concerned about environmental problems and their personal implications than their counterparts in developed countries. 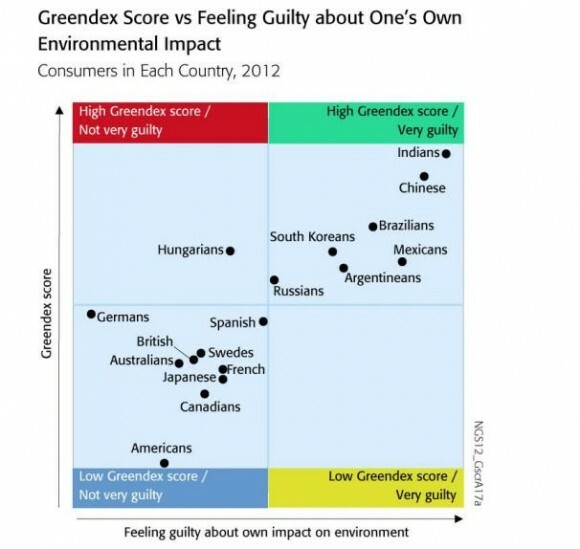 Yet, when it comes to interpreting the meaning of consumers’ purchases and lifestyle choices, the Greendex index may be more indicative of a country’s economic and environmental characteristics than a gauge of green consumer behavior. Consumers in the highest scoring developing countries often do not have the income or access to the conveniences, luxuries and supporting infrastructure that cause consumers in developed countries to lose points for unsustainable consumption. If given the same opportunity, consumers in developing countries may make many of the same choices. For example, while India, China and Brazil take the top three spots in the Greendex’s overall ranking, consumers in each country are most likely to agree with the statement, “Owning a luxury car is a very important goal in my life,” and among the most likely to agree with the statement, “Owning a big house is a very important goal in my life.” By contrast, several of the countries far less likely to agree with these statements, including Germany, Sweden and France, place much lower in the overall Greendex country ranking. On the other hand, consumer behavior does not neatly break down along developing and developed country lines. Consumers in European countries tend to make far more frequent use of public transportation than those in the U.S. 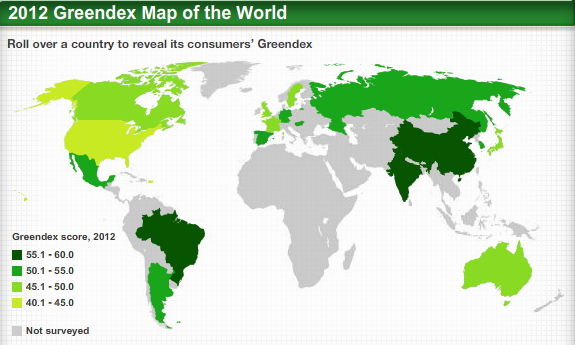 Overall, the Greendex findings point to much room for improvement around the world. Businesses and governments would do well to look for ways to turn these challenges into opportunities. By appealing to the environmental concerns of consumers in the BRIC countries and Latin America, resourceful companies can expand markets for new green products, services and technologies. Forward-looking governments can choose policies and build infrastructure that make it more convenient and cost effective for consumers to choose public transportation and renewable energy over less sustainable alternatives.